This story is published by Richmond Confidential. Bethany Sullivan sits in the front lobby at Milo Foundation on Wednesday, Oct. 25. She took Diana (left), an American bulldog fostered a few days ago, back to remove stitches left by a surgery. Tory (right), whose right front leg was amputated due to injury, has been kept by Sullivan since last July. Diana lies on the ground before the blood test for detecting heartworm infection. She was kept by an animal control shelter in Merced County and was about to be euthanized due to overpopulation of animals in the shelter before taken over by the foundation, according to Sullivan. Pet food sits on the shelf in the front lobby of the adoption center, much of which was donated by volunteers and community members after wildfires broke out up north in early October, according to staff member Angel Wiley. Photographer Liz Greer (left) sets up a temporary studio in the adoption center for a photoshoot. She started doing voluntary work for the foundation about a year and a half ago and has been practicing photography since her retirement from software marketing in 2014. Greer said she has photographed over 1,000 dogs and cats. Greer carries Delta, a 4-month-old German shepherd, back to the shelter after a photoshoot. Before Delta was sent to the shelter, it was found dumped in an empty house, according to staff member Holly Baroni. 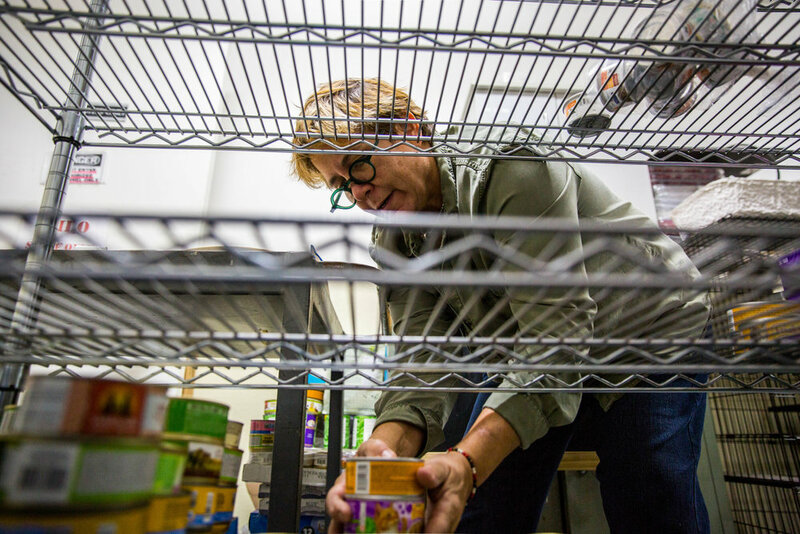 Lynne Tingle, founder and director of Milo Foundation, places cat food on the shelf at the adoption center on Wednesday, Nov. 2. Staff member Clare Davis takes Sigma, a young German shepherd, out for a walk. The adoption center keep roughly 50 dogs, and to ensure all of them enough exercise every day, staff members have to rotate each dog at least three times a day. Jasmine, a 6-year-old brown mastiff, sits in her cubicle after spilling her food bowl on Wednesday, Nov. 2. Received by the Milo Foundation after Hurricane Harvey, Jasmine is the only dog from Texas that hasn’t yet been fostered or adopted. Clare Davis puts blankets donated by volunteers and community members into the washing machine on Wednesday, Oct. 25. Davis said staff members have to do laundry multiple times a day and take some back home to clean occasionally. According to director Tingle, the electricity bill at the adoption center can reach about $1,000 a month. Staff member Amanda Davis (left) and Holly Baroni (right) prepare to transfer some of the dogs back to the sanctuary in Willits, California, after receiving permission from the local sheriff. After drawing a tube of blood from the front left leg of Diana, an 8-year-old American bulldog, outreach coordinator John Fonseca commended her as she laid on the bench at the adoption center of Milo Foundation, an animal rescue group based in Point Richmond. “You did good, Diana,” Fonseca said. Bethany Sullivan, Diana’s foster parent, was constantly caressing the dog’s abdomen. Although Sullivan’s own dog was sitting on the ground a couple of yards away, the deep concerns on her face might make you think that she had kept Diana for years, instead of a few days. Most families may spend some time deciding what animal to foster as a temporary house guest, but when Sullivan visited the shelter last Sunday, she knew she had to rescue one, anyone. What she did wasn’t only fostering a homeless dog: It was a contribution to the shelter’s disaster response efforts. Apart from the adoption center in Point Richmond, Milo Foundation has a sanctuary near Willits, California. Lynne Tingle, founder and director, purchased the property in 1993 and has used the rural setting and ample space to house animals that are more behaviorally challenged and less likely to be adopted or fostered. Fonseca described the sanctuary as a “boarding school,” providing a less stimulating environment for undisciplined animals to “mellow out a little bit,” making them more approachable and adoptable. At 3:30 in the morning of October 16, Tingle was woken up by a phone call from a former manager: The wildfires were coming toward Willits. According to Tingle, the team evacuated more than 170 animals in total. Staff member Amanda Davis, who has been working for Milo Foundation for five years, said she had never experienced anything like that before. Fires didn’t hit the sanctuary, but Davis ended up sleeping in her truck that night so that she was closer to the animals in case of emergency. Fostering and adoptions started immediately at the scene, but space was still needed at the adoption center back in Point Richmond to accommodate the rest of the displaced animals. According to Fonseca, about 75 fosters were made in 12 hours thanks to volunteers and community members from all over the Bay Area. Sullivan, an Oakland resident, picked up Diana a week later. 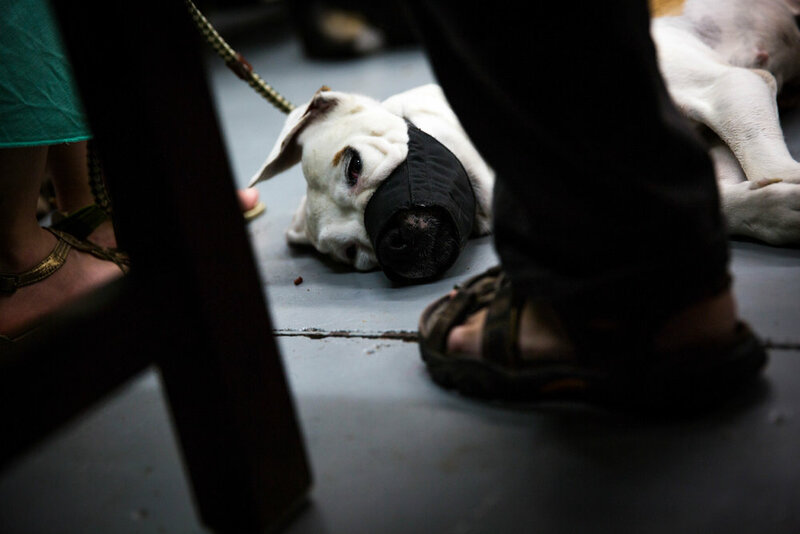 Still wearing a muzzle on her head, Diana looked weak and exhausted after the blood test. Although she also had some stitches removed on her abdomen and back legs as a result of surgical cysts and lymphomas removal, Diana was lucky. According to Sullivan, Diana was on the verge of being euthanized at an animal control shelter in Merced County before being picked up by Milo Foundation, which labels itself as a “no-kill” shelter. “No-kill” means that a shelter doesn’t put down healthy or treatable animals due to lack of space and only euthanizes those that are terminally ill or considered a threat to public safety. In order for many shelters across the country to keep the “no-kill” status, they need to maintain the live release rate above 90 percent, meaning that nine of every 10 animals get to leave the shelter alive. 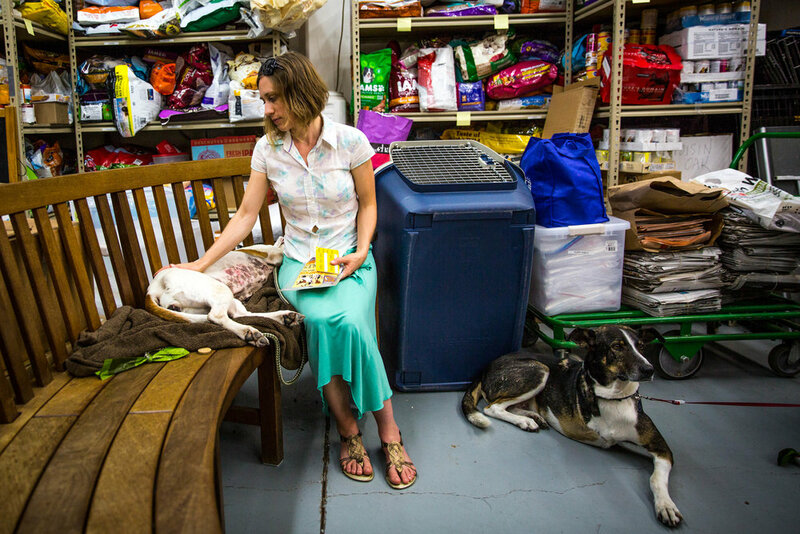 Sanctuaries that offer lifetime care for homeless animals aren’t uncommon, but running a spacious one in the hills to address overcrowding is rather unique for an adoption center. It’s a service beyond the reach of most urban adoption centers. According to the American Society for the Prevention of Cruelty to Animals (ASPCA), approximately 1.5 million animals are euthanized in shelters nationwide every year, a decrease from about 2.6 million in 2011. Despite the recent positive signs, director Tingle still remembers the horrifying scenes she witnessed while rescuing animals in the Central Valley region in the late ’90s. California was one of the first states that tried to alleviate overpopulation in shelters and encourage the concept of “no-kill,” when lawmakers passed a series of bills in 1998. The state is still setting precedents to push for animal welfare in shelters to this day. Last month, Gov. Jerry Brown signed Assembly Bill 485, which requires pet stores to sell dogs, cats and rabbits obtained from shelters or rescue groups — instead of from breeders and puppy mills — starting from January 2019, making California the first state to pass such legislation. The bill can potentially ease the overabundance of animals in shelters. However, it does not prohibit breeders from selling animals directly to individuals. Fonseca said the legislative move is a positive development, but it will take some time before people get fully on board with it, partly due to concerns regarding the source of animals offered by shelters. In other words, puppies produced by the puppy mill supply chain can become future liability for shelters. Tingle and staff members are currently in the process of transferring animals back to their Willits sanctuary after receiving permission from the local sheriff. 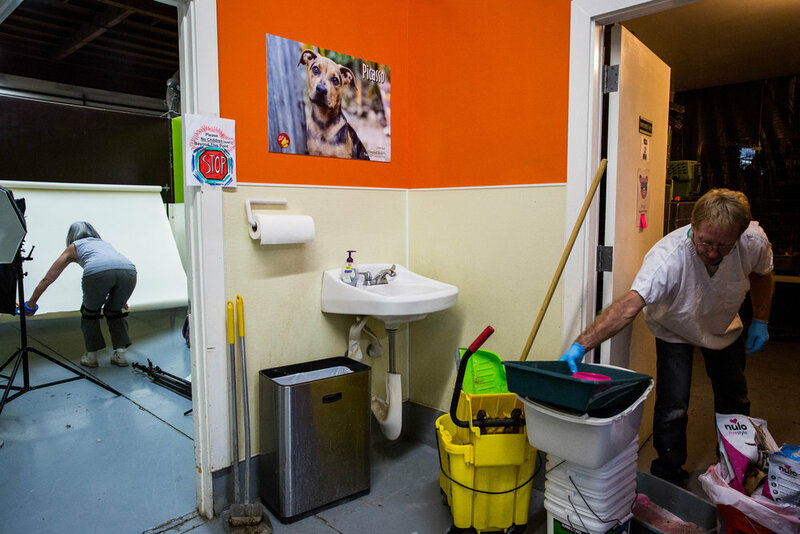 Overcrowding is not something Milo Foundation would be worried about, thanks to the sanctuary up north, but the adoption center in Point Richmond still has to provide shelter, food and daily care for about 50 dogs and a fair number of cats every day. The noisiest and most hectic space here is the “main ward,” a room containing dozens of cubicles used to house adult dogs. Although staff members wipe the floor and clean each cubicle on a daily basis, urine and feces odor still lingers. All the dogs are fed twice and taken out for exercise at least three times a day, but staff member Baroni said the environment in a shelter is still probably the most stressful for dogs. Every time strangers step in, or another dog is walked back after rotation, fierce barking fills the air in the main ward. Jasmine, a 6-year old brown mastiff, seemed oblivious to all the reactions. She just knocked over a bowl full of food, which didn’t seem to interest her at all. “She doesn’t like it,” said staff member Clare Davis. Jasmine is one of the 38 dogs taken by Milo Foundation during the Hurricane Harvey relief efforts in September. 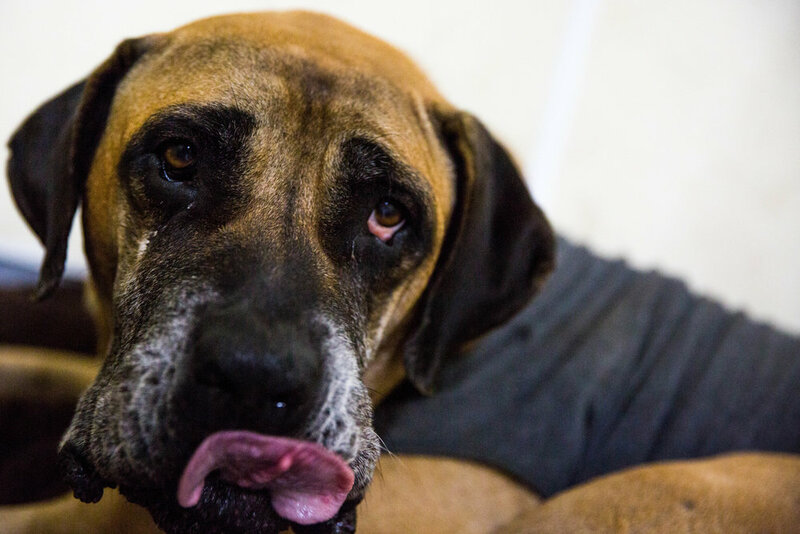 After Hurricane Harvey hit and paralyzed Houston, Milo Foundation contacted an animal rescue group based in Austin, which has been the country’s largest no-kill city for almost six years. The group was trying to transfer as many adoptable dogs as possible to make room for evacuees, since euthanasia was against the “no-kill” status. “The basic goal was to take animals to deviate the overcrowding that was going to happen in the local shelters so that the local community could rectify their circumstance,” Fonseca said. Emily Schneider, director of media and communications at ASPCA, a national nonprofit experienced in assisting local shelters in evacuating and transferring animals during disaster response, said that since there’s no one organization overseeing relocations for animals in times of disaster, the process takes lot of collaboration among different rescue groups and shelters. 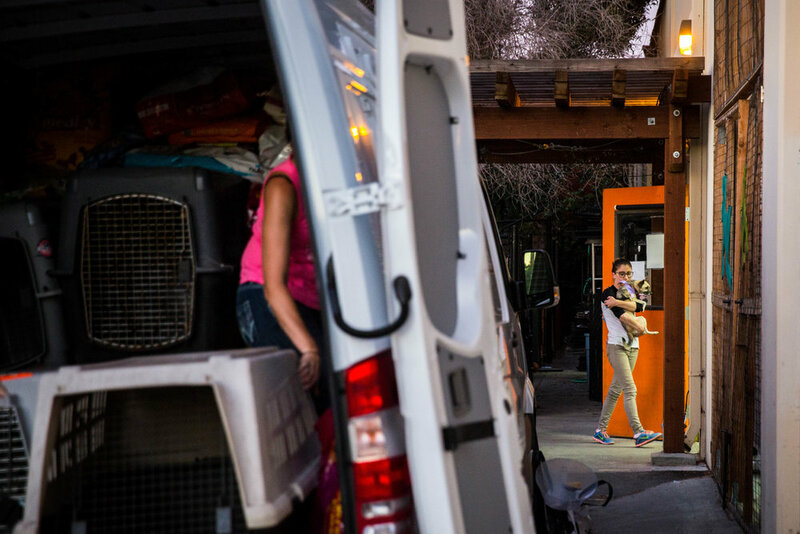 According to Schneider, destinations of these transfers are largely determined by their network and contacts, the receiving shelter’s ability to house additional animals and the likelihood of adopting these animals out. “Relocation is really about giving homeless animals the best chance of finding safe and loving homes,” Schneider said. Lying on a blanket inside her cubicle, Jasmine cast her eyes down and wrinkled the top of her head. She is still taking medication for her heartworm condition, a parasite prevalent in the South that may lead to serious illness. All adult dogs received by Milo Foundation tested positive for heartworm. Jasmine is the only dog from Texas left in the adoption center two months after finding herself in California. Baroni said it’s hard for her to watch some of the animals stuck in a shelter whether it’s because of the stigmatized breed or not being able to make an appealing first impression in front of people. “The less time an animal spends in the shelter, the better,” Baroni said.